Question: which of the following bottles contains more applejack than the other — the one to the left or the one to the right? Answer: the one on the left. It is straight apple brandy, or pure applejack. The other one is blended applejack. 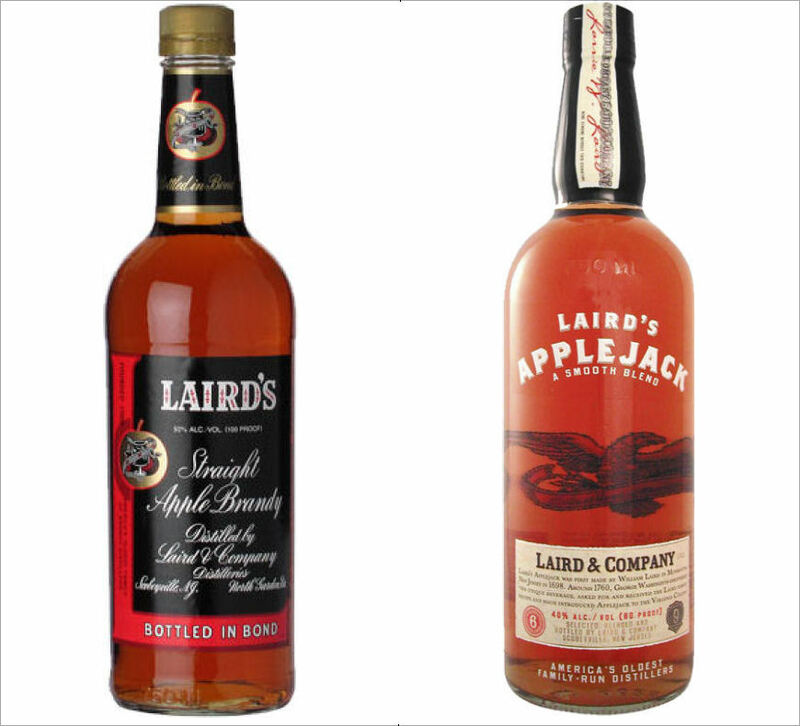 Applejack and apple brandy from the U.S.A. are the same thing — both traditionally and legally. Thus, blended applejack is is made by blending applejack, or apple brandy, with a greater amount of neutral grain spirits. Straight applejack, or straight apple brandy, is the pure stuff. The Scottish analog would be that malt whisky is pure, barley whisky, while blended whisky is a little malt whisky blended with a greater amount of neutral grain spirit. I think of blended whisky as whisky-flavored vodka. I think of blended applejack as applejack-flavored vodka. I use the older, more traditional term of “straight applejack” throughout my book when referring to un-blended American apple brandy. That should not be misunderstood by anyone as an instruction to use “blended applejack” in any of my recipes! 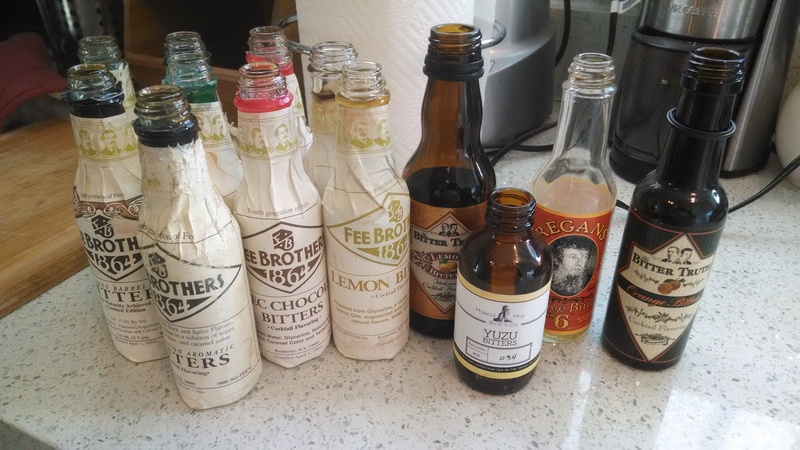 Over the years I have ended up with a lot of imitation bitters and bad bitters. I consider any ‘bitters’ made with glycerin instead of spirits to be imitation. I consider any bitters to be bad if their flavor is inferior — or, if they lack the bitterness needed to remove the sensation of alcoholic harshness in a true cocktail. I will never use imitation bitters or bad bitters in any tipple that I want to serve or drink. I have no interest in packing them up and taking them north. Today I emptied all of the above-pictured products down the drain. That freed up the bottles (and their dasher inserts) to be stripped of their labels, washed and set aside for the students in the Ingredient Fabrication Course to use to take home the peach bitters we will be making. P.S. – Since posting, I found a bottle of Elmegirab’s guess at Boker’s bitters and a couple of bottles of things by the San Francisco Diego bitters company. All of that stuff went down the drain to free up the more valuable empty bottles!